The Baiyoke Sky Hotel, Thailand's tallest hotel, is located in the centre of downtown, surrounded by shopping malls and market. Beside Pratunam Market, a bustling garment market, the customers can easily walk to other shopping centers: Central World Plaza (originally World Trade Center), Gaysorn Plaza, Peninsula plaza, Rajprasong Intersection, Sogo Department Store, Central Department Store, Siam Square, and MBK Center. Within 88 storeys, there's a garment center on the first four floors, convention center, hotel rooms, restaurants, the observation deck, etc. 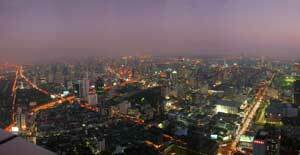 The most outstanding advantage of the hotel is the view of Bangkok from the highest deck of Thailand on the 77th and 84th Floor (from which, on a clear day, you can see far away beyond the Chao Phraya River to the Gulf of Thailand). Also, there're other facilities for the customers: health & fitness club, swimming pool, and special services the customers can get in the hotel. Let's reach the sky with the Baiyoke Sky Hotel.